Share market highlights: The domestic stock markets rallied on Wednesday, with the 30-share BSE Sensex zooming more than 450 points, even as the broader Nifty 50 closed above the psychological 10,450 mark. Share market highlights: BSE Sensex closed at 34,760.89, up by more than 1.35% on Wednesday. Share market highlights: The domestic stock markets rallied on Wednesday, with the 30-share BSE Sensex zooming more than 450 points, even as the broader Nifty 50 closed above the psychological 10,450 mark. BSE Sensex closed at 34,760.89, up by more than 1.35%; while Nifty closed at 10,461, up by 1.54%. Earlier, Sensex rallied to an to an intra-day high of 34,858.35 points on Wednesday led by gains in banking and NBFC stocks. The NSE Nifty 50 traded firmly above the 10,450-level and scaled a high of 10,479.65 points during the mid-afternoon trade deals. However, the IT sector continued to trade with losses. 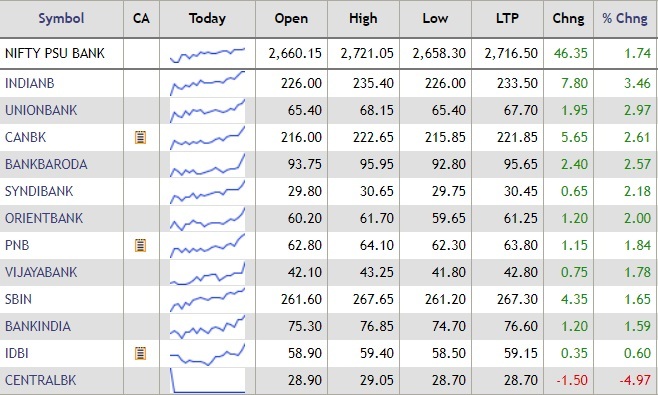 Notably, shares of Axis Bank, SBI, Maruti Suzuki, Yes Bank, ICICI Bank were among the top gainers on Wednesday, ralling by up to 6%, while shares of IT majors, Infosys, TCS lost more than 2% each in the afternoon trade. 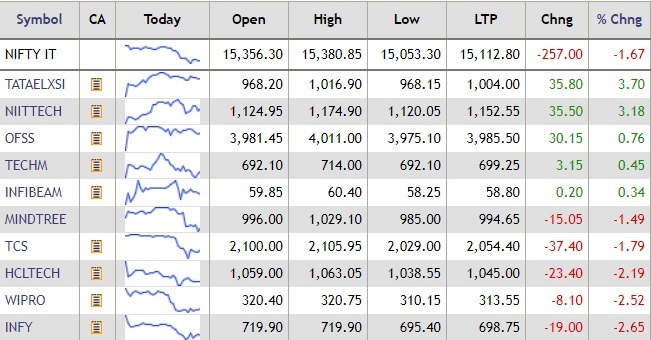 In the Nifty, shares of Bajaj Finserv, Bajaj Finance rallied by more than 10% each, while shares of Infratel, HCL Tech were among the top losers, shedding more than 1.5% each. In the global markets, Asian shares barely moved on Wednesday after world stocks hit eight-week lows the previous day on worries about global economic growth, although the British pound stayed firm on hopes for a Brexit deal, said a Reuters report. Oil prices edged lower after the IMF lowered its global growth forecasts but prices were somewhat supported as Hurricane Michael churned towards Florida, causing the shutdown of nearly 40% of U.S. Gulf of Mexico crude output. The domestic stock markets closed higher on Wednesday, led by strong gains in financials. The 30-shares Sensex rallied by more than 461 points to close at 34,760, while the broader Nifty 50 rallied to 10,461 at close. Shares of Axis Bank, SBI, Maruti Suzuki, Yes Bank, ICICI Bank were among the top gainers on Wednesday, ralling by up to 6%. 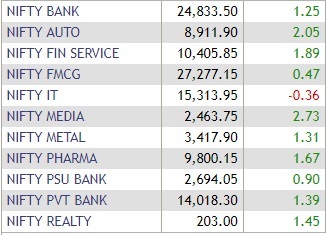 Shares of IT majors, Infosys, TCS and Sun Pharma lost more than 2% each in the afternoon trade. Bandhan Bank has reported a 47% on-year rise in net profit in the Jul-Sep quarter to 448 crore, even as asset quality remained stable in the latest quarter. The NII (net interest income) also showed a robust 56% rise to Rs 1,078 crore. Asset quality remained stable, as the Gross non-performing assets as a percentage of gross advances rose 1.3% in the quarter under review from 1.26 percent in previous quarter and net NPAs were higher at 0.7% in the latest quarter. Bandhan Bank shares rose by nearly 4.5% after the results to hit an intra-day high of Rs 521.35. BSE live: Sensex surges nearly 500 points! The BSE Sensex surged 492 points to an intra-day high of 34,820.74 points during mid-afternoon trade deals on Wednesday. ICICI Bank contributed nearly 100 points to the Sensex, followed by HDFC (80.37), Axis Bank (56.79), HDFC Bank (52.10) among others. The Nifty IT index was trading with losses on Wednesday as shares of IT giants TCS and Infosys were dragging the index lower. 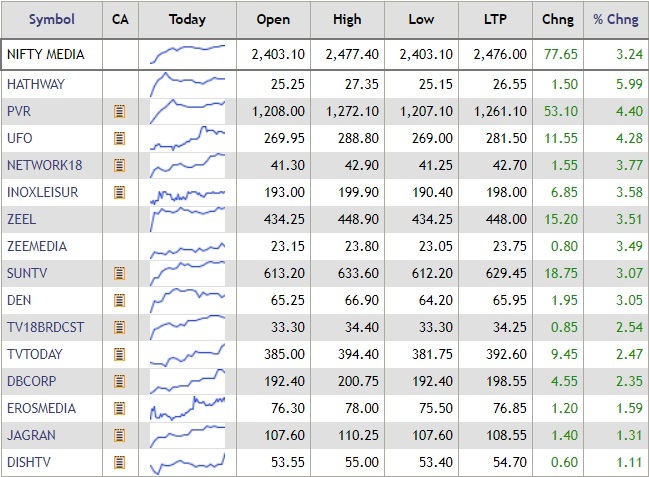 On the other hand, Tata Elxsi, Tech Mahindra and Infibeam Avenue shares gained up to 3%. Shares of aviation companies rose on Wednesday after media reports said the governement is likely to submit a proposal to the Election Commission to cut excise duty on aviation turbine fuel (ATF). Jet Airways shares rose nerly 8%, while shares of Interglobe Aviationclimbed 6.1% to Rs 768.40. Spicejet Ltd gained 7.1% to Rs 69.90 per share. IDBI Bank on Wednesday said Rakesh Sharma has assumed charge as MD & CEO of IDBI Bank w.e.f. October 10, 2018. Earlier Sharma served as the MD&CEO of Canara Bank for a period of 3 years from September 11, 2015 till July 31, 2018. Canara Bank shares traded 3.67% higher at Rs 224.45 per share on the BSE. Syndicate Bank on Wednesday said it has increased its marginal cost of funds based lending rate (MCLR) by 10 basis points or 0.1% for loan tenure of 3 months. Interest rates for loan tenure of three months has been hiked to 8.50% from 8.40% earlier. The bank has reviewed MCLR and the new rate would be effective October 10, Syndicate Bank said in a filing to stock exchanges. Interest rates for loan tenors of overnight, one month, six months and one year remain unchanged to 8.30%, 8.35%, 8.60%, and 8.80%, respectively. Shares of Syndicate bank were trading 4.54% higher at Rs 31.10 per share on the BSE. Gold prices held steady on Wednesday as expectations of more U.S. interest rate increases pressured demand, although the metal drew some support from the dollar coming off a seven-week high, according to a Reuters report. Spot gold was little changed at $1,189.05 an ounce at 0513 GMT, moving largely within a slim $3 range during the session. U.S. gold futures rose 0.1% to $1,193.20 an ounce. Oil prices edged lower on Wednesday after the IMF lowered its global growth forecasts but prices were supported as Hurricane Michael churned towards Florida, causing the shutdown of nearly 40% of U.S. Gulf of Mexico crude output, said a Reuters report. Brent crude futures were down 21 cents at $84.79 a barrel by 0434 GMT, after a 1.3% gain on Tuesday. U.S. West Texas Intermediate (WTI) crude was down by 34 cents, or 0.5% at $74.62 a barrel, after rising nearly 1% in the previous session. The International Monetary Fund downgraded its global economic growth forecasts for 2018 and 2019 on Tuesday, raising concerns that demand for oil products may slump as well. Trade tensions and rising import tariffs were taking a toll on commerce, while emerging markets struggle with tighter financial conditions and capital outflows, the IMF said. Shares of power producer NLC India Ltd jumped 12.6% to Rs 83 on the NSE after the company on Tuesday approved a share buyback proposal of 12.49 bln rupees (Rs 16.83 crore). The stock hit its highest level since June 27 and posted its biggest intraday percentage gain since March 21 last year. NLC India's stock has fallen about 33% this year since its last close. Shares of non-banking financial companies (NBFC) surged about 5-9% in early trade on Wednesday after State Bank of India on Tuesday said it will raise its target to buy 'good quality' asset portfolios from NBFCs. Shriram Transport Finance shares gained 8.7% in morning trade deals, while Bajaj Finance Ltd gained 8.2%. DHFL was up 9.5%, Edelweiss Financial Services Ltd gained 7.8%, JM Financial Ltd stock rose 7.9% and IIFL Holdings Ltd was up 3%. Garden Reach Shipbuilders & Engineers shares got listed at a discount of 13.14% to the issue price at Rs 102.50 on the NSE. The issue price was at Rs 118. On the BSE, the scrip got listed at Rs 104, down 12%. The initial public offer (IPO) of the company was open for subscription from September 24-26. However, due to lack of investor interest, the IPO offer period was extended to October 1 and price was revised downward to Rs 114-118 per share from from Rs 115-118. 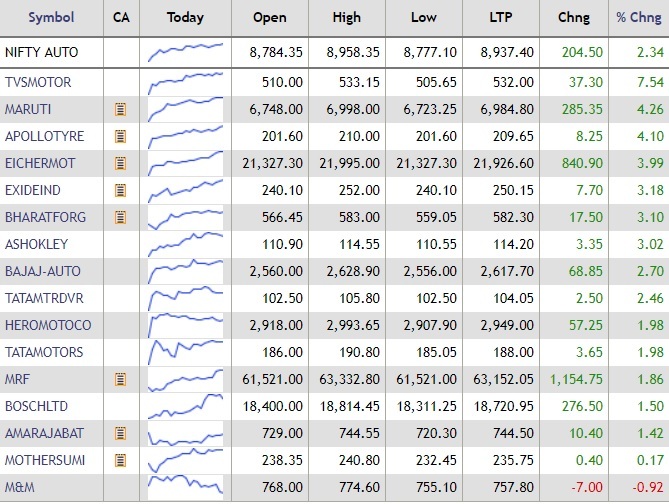 All the Nifty sectoral indices traded in the green during morning trade deals on Wednesday, barring the IT index. The Nifty media index led the gains, followed by Nifty auto, financial services, pharma, realty and private bank indices. These are the most traded stocks by value on the NSE in the first 45 minutes of trade on Wednesday. The battered rupee rose 23 paise to 74.16 against the US dollar Wednesday after the American currency weakened overseas amid increased selling by exporters, said a PTI report. Besides, RBI's decision to inject Rs 12,000 crore liquidity into the system through purchase of government bonds on October 11 to meet the festival season demand for funds also supported the recovery in rupee, dealers said. A higher opening of domestic equity markets too aided the recovery in the domestic unit. The BSE Sensex surged nearly 230 points to a high of 34,543.04 points during the first half an hour of trade on Wednesday with gains in auto sector stocks. Here MotoCorp rose over 3% in early morning trade deals. The BSE Sensex opened over 100 points higher on Wednesday. The NSE Nifty opened at 10,331.85 points, up 30 points from its Tuesday's close. Hero MotoCorp was the top gainer on the Sensex in opening trade deals. SBI: State Bank of India (SBI) will buy good quality assets worth Rs 45,000 crore from NBFCs that are facing liquidity crunch triggered by a series of debt repayment defaults by financial conglomerate IL&FS and its subsidiaries. SBI, which earlier planned to purchase assets worth Rs 15,000 crore, has decided to buy additional assets of up to Rs 30,000 crore, said a PTI report. Tata Motors: Tata Motors reported 6% rise in global sales, including that of Jaguar Land Rover (JLR), to 1,23,577 units in last month. Bandhan Bank, Zee: Among the companies that will announce their second quarter results today are Zee Entertainment, Bandhan Bank and Indiabulls Ventures, among others. NALCO: In a filing to the BSE, National Aluminium Company said its Board of Directors will consider share buyback on October 12. "Continued weakness in the emerging market currencies on the back of strong USD and domestic markets dragged the Indian Rupee, which plunged to new lows. After opening higher at 73.93, the local currency made a high of 73.88, but came under pressure on the sustained capital outflows and rising crude oil prices. Rupee ended at 74.39, settled below the 74-mark for the second day. In the week, RBI scheduled to pump in Rs 12000cr to system via OMO in order to manage liquidity on Oct 11. CPI and IIP are scheduled to be released on Friday while trade balance figures are also due in the week. FIIs were sellers in the equity markets segment; sold to the tune of Rs 1242.46cr and on the other end, crude oil crossed the $84 mark. For local currency, now 74.53 may act as a support level while on the other end 73.54 and 73.23 are the resistance levels." -- Geojit Financial Services said in a note. The BSE Sensex opened higher by over 100 points during the pre-open session on Wednesday. The Nifty was trading almost 30 points higher. The Indian rupee opened at 74.13 against the US dollar. Asian shares steadied in early Wednesday trade after world stocks hit eight-week lows the previous day on worries about global economic growth, although the pound stayed firm on hopes for a Brexit deal, a Reuters report said. MSCI's broadest index of Asia-Pacific shares outside Japan edged up 0.3%, while Japan's Nikkei gained 0.25%. The Australian benchmark was up 0.11%. Share market on Tuesday: The Sensex and Nifty closed in the negative territory tracking weakness in the Indian rupee, along with higher crude prices and weak Asian markets. Heavy selling pressure in auto, FMCG, PSU banks and realty stocks, too, kept the domestic stock markets under pressure. The Indian rupee on Tuesday plunged to a fresh record low of 74.3538 against the US dollar.